Luisne Artist Martin O’Reilly’s Carrots and Soup. 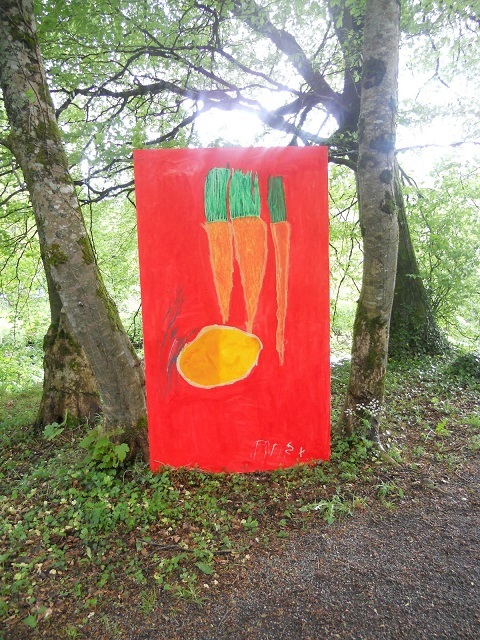 The Luisne Arts group, Ballinrobe, have eight vibrant pieces of large scale art work on display in the grounds of the Museum of Country Life, Turlough. The work was installed as part of the Onsight programme of outdoor art installations during this year's Féile na Tuaithe and will continue to be on display till the end of September. On entering the main gates at the Museum, the work is located on the left hand side in amongst the trees. This outdoor work will withstand whatever the Irish Summer has to offer and we're hoping it will be more Sun than rain. The theme the artists explored was Traditional Farmhouse Fare with the idea of Farm to Plate; the resulting colourful, skilled work is well worth a visit. The following work is on display: Emer Prendergast's Stew, Horses and Sheep, John Walsh's Sheep, Hens and Chicken Dinner, Mairead Coyne's Donkey, Goats and Hens, Martin O'Reilly's Carrots and Soup, Patrick Wall's Cattle and Pigs, Peter Shaugnessy's Cows and Round Bales, Bridie Lally's Sheep and Lambs and Theresa Dooley's Dinner on the table.